I got the idea for this one last week watching the Food Network. Up until then, I had pretty much planned on doing the usual herbal thang that's been in my 14" Dutch Oven for the last few Thanksgivings. But when I saw them stuffing oranges and lemons in the body cavity, I got really intrigued. Unfortunately, when I went back a few days later, I couldn't find the recipe. I'd forgotten the show I'd seen it on, as well as the chef's name that demo'ed it. Still, the 'net is huge, and after a few searches and a bit of experimenting, I arrived at my usual conglomeration of ingredients, pulled from many different recipes. The results were staggering. It was moist and tender (most of the time dutch oven turkeys are), and the delicte hint of lemon and citrus throughout the meat was especially tasty. My guests (excellent chefs in their own right) pronounced it delicious, and my wife said it was the best turkey she'd ever tasted. I pulled the turkey out of the freezer and put it into the fridge for a few days before Thanksgiving. It was getting soft, but still quite frozen the night before, so I put it in my kitchen sink to fully thaw overnight. Even still, there were still some frosty parts deep inside when I went to put in my stuffing. I started off lighting up a lot of coals. You can see from the header, there, that we're talking around 40, just to get it started. Once it was cooking, too, I developed a system of transferring on new coals as the old ones burned off that worked pretty well. More on that in a minute. In the kitchen, first, I cut open the turkey bag and let it drain. I put it onto a towel on my kitchen counter. Then, I made the baste. I put the softened butter in a bowl, and zested up a lemon. I added that and the juice to the butter, as well as the garlic, etc... It was pretty easy to mix. I also cut up the stuffing items and got those ready. The stuffing step was pretty easy. I just packed it full, alternating items between the lemons, the onions, and the oranges. I pressed it in pretty tight, partly to get more there, and partly to squeeze it a bit to get more juices flowing from the fruits. Then, I put that into my 14" dutch oven. People are sometimes surprised that I can cook a turkey in a dutch oven, but they're often looking at the 20+ pound toms. We've only got four in the family, and with only two guests, the smaller bird makes more sense, and it fits in my oven. Then, I took my baste and coated the top of the bird with it. I like to poke holes in the skin to allow the baste and the seasonings to seep in. Then I sprinkled it with more kosher salt (I like the bigger granules) and the pepper. Then, I cut up the surrounding veggies, and packed those in surrounding the bird. Finally, I added the slices of citrus on top. It was ready for the coals. In some ways, this qualifies as a basic dutching dump meal, because you really do just put everything in and the cook it on the coals. But because there's so much in the management of the heat, over such a long period of time, I'd hesitate to call it "basic". 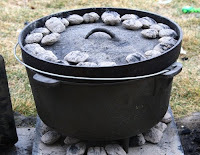 About every 20 minutes, I'd pour a few more fresh coals into the metal chimney next to the dutch oven. Then, I'd shake it up to circulate the already lit coals in between the new ones, so they'd all get lit. Then, every so often, as I could see the coals burning down, I'd pull 5-8 larger lit coals from the chimney fire, and add them on top. I'd pull 3-4 and just set them on the bottom. By doing that, the old coals burned out, the new ones came on frequently, and I was pretty much able to maintain a 350-375 degree temperature throughout. It took about 3-4 hours to cook. A little longer than I'd wanted, but it was worth waiting for, and my guests were patient. The last 30 minutes or so, I put a lot of extra coals on the lid, and that helped brown the upper skin. When you take it off the coals, bring it in for everyone to ooh and ah and sniff over, and let it sit for 10-15 minutes. That'll finish off the cooking and let the meat settle into the juices and the seasonings. Another hint I learned from the Food Network. When you're carving the turkey, cut off the leg first, then in a deep sweeping cut, take the whole breast off. Set that on the plate, and slice it into pieces. That way, not only is it quicker, but everyone gets a bit of the crispy and flavorful skin as well. Hello, your turkey looks great. I just got started with a dutch oven and got my first one for a present.